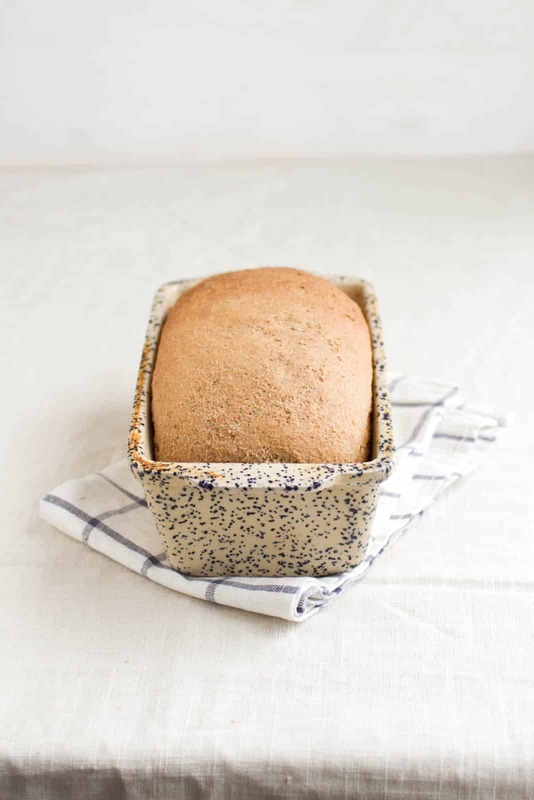 Swedish Rye Bread | Naturally. This recipe is one of the few family recipes I have tucked away in my notebook. For those of you who are Swedish, I can’t explain why it’s called Swedish Rye Bread beyond the little I know about this recipe. This Swedish rye bread recipe came from a Swedish neighbor of my grandmother’s and ever since then, it’s been a staple in my family. She doesn’t make it anymore but I want to keep the tradition alive because of the stories around this bread (including my great aunt cutting the bread lengthwise, toasting, and lathering it with butter.) This recipe works well with a light rye flour but can be made with any rye. The original recipe calls for Rye and All Purpose flour but I milled some fine wheat flour to replace the all purpose flour. In the bowl of a stand mixer combine the water, yeast, and sweetener- give a quick stir and let sit until yeast becomes active, 5 to 10 minutes. Stir in oil, sorghum, salt, and rye flour. Start bread with the dough hook. Add 1/2 cup of all purpose flour and continue to slowly add flour (1-2 tablespoons at a time) until dough pulls away from the side of the bowl. Let run for 8-10 minutes. This will give you time to adjust flour and let the dough knead. Remember- you can always add flour but you can’t always take it away. The dough should be soft and slightly sticky. Cover with a damp towel and set aside to rise for 1to 1 1/2 hours. Once the first rise is over, knead a couple of times into the form of a log. Place in an oiled bread pan, cover again and set aside for about 1 hour. With 30 minutes left, pre-heat your oven to 350˚ F.
Once the loaf has risen the second time, place in oven. (if you have a bottle of water, mist the bottom of your oven a couple of times to get some steam going.) Shut the oven door and let bake for 20 minutes. Cover with a brown paper bag and continue to bake for another 30-40 minutes. Bread should have a golden crust and sound hollow when you tap on the bottom. Remove bread from pan and let cool before slicing. * for the brown paper bag, I cut a slit in one width side of the bags and then slip it over the top and sides of the loaf. If you use other ways to prevent from too much browning, you are also able to use them! I have a vitamix (my usual vessel for at-home grain milling), but kind of feel like I need a grain mill now after your awesome summary. And your loaf pan is beautiful! I was amazed at how well and fast it worked! And my pan is from a pottery company in the town I live- I love their stuff! Could you elaborate on the brown paper part? Does the whole loaf/pan go inside the bag? I added the explanation into the notes. I cut in a slit in the side and cover the sides/top so that the top doesn’t brown too much. I would show you where you could buy it but they stopped making them! Beautiful loaf. I like your pan too. I am keeping my eyes out for good bread recipes. This looks like a great one! That grain mill sounds awesome and like a worthy addition to any baker’s kitchen! Homemade bread is the best…and even better with that wonderful rye flavor. I have had some rye flour sitting in my cupboard for FOREVER…and it shall certainly have a home in this bread! Well, the only reason I know it’s Swedish is because it’s family traditions from the Swedish that immigrated to the U.S. Where I live there was a rather large population of Swedes and there are a couple versions of this bread. So it’s not that this bread IS Swedish, it’s just a mark of heritage. That was my guess, but it’s always interesting to learn what non-Swedes see as typical. By the way, I wasn’t trying to put you on the spot. Your bread resembles one my grandmother used to make. Haha no worries! I actually found out that the recipe was a neighbor’s that was brought over by her grandmother when she immigrated from Sweden in the 1800’s. I really want to try this bread, but have never seen sorghum anywhere. Can I substitute it for something else? I’ve sometimes substituted molasses and then added just a touch more brown sugar! My mom has been grinding her own wheat flour for many years. She bought a whisper mill to make her own bread and I can’t remember the last time my parents bought bread. Every time I visit home I always try to have an empty container to bring home fresh flour 🙂 Enjoy your mill! It’s very similar to yours, isn’t it? Hope this clears up some confusion and thank you for the greetings from Norway! Wow – how interesting! Thank you for clearing up my confusion and for teaching me something new 🙂 I just googled sweet sorghum, I had no idea that this is such an interesting plant, with so many uses. 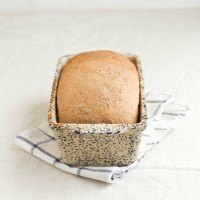 I made this bread this weekend and with everything else from your recipes it was delicious! I coud not find sorghum, and to make it a bit different I used Lyle’s Golden Syrup. So good! I have the Wonder Mill. I love it and use it all the time. My preferred wheatberries to use for bread is a hard white wheat distributed by Montana Wheat called Prairie Gold. I also found out that in most larger Walmart stores they carry it in 25 pound bags in the flour section for a very reasonable price. Also they have the already ground flour from the same type of wheatberries, also called Prairie Gold flour. the hard red wheatberries are called Bronze Chief. It’s called Swedish Rye bread because it is a recipe that Swedes migrating from Sweden in the 1850’s brought with them. Many of these people went west to Minnesota, Wisconsin and Nebraska to seek land for farming. The Swedish Rye bread was usually made around Christmas time —and I know in the tiny NE town my Grandmother lived people began asking around October if they would be on my Grandmother’s “Christmas Bread gift list”. In my mother’s house, her mother called it “Minnie’s Rye Bread” and it was a handwritten recipe handed down from her mother-in-law. in the original recipe the temperature was lower by 50 degrees (300 degrees) and baked for 1 hour and 15 minutes, then loaves turned out on their side to cool, covered with dish cloth while cooling. Store in paper lunch sacks, tie closed with ribbon and pass out to friends, …in my opinion it is the ONLY bread on which to have a turkey sandwich the day after Christmas dinner.